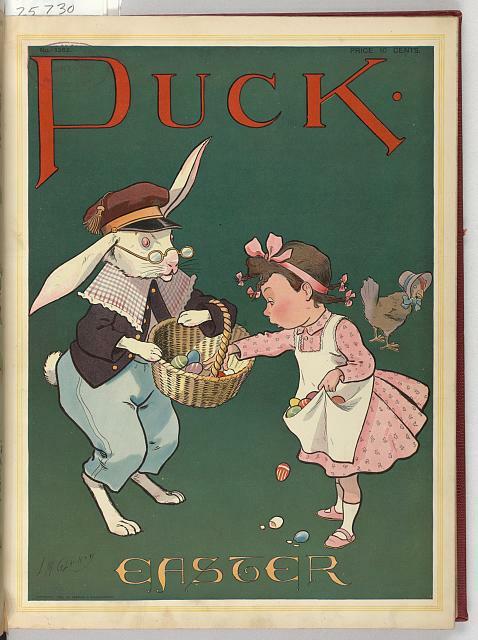 World O' Crap: Happy Easter, Everyone! Yeah, reminds me of the Far Side where a woman is walking into her house carrying a basket of eggs and a chicken is walking out carrying her baby. Spurs and a dress. An elegant Easter combination. That's the result of too many pagan traditions being lumped together. I mean - rabbits with eggs?? Little chickies and chocolate eggs?? Bunnies and sweeties?? Nah, you're right - let's call the whole thing off.Have a lovely long weekend, y'all. And be parted from my precious Cadbury Creme Eggs? Never, Suezboo, never! Possible explanation for this picture. An evil wizard put a curse on the lady-- "You will turn into the very next thing you think of!" And what was the next thing she thought of? Either that, or pop surrealism goes back much farther than any of us ever suspected. Lent is over, happy dingus day everyone. 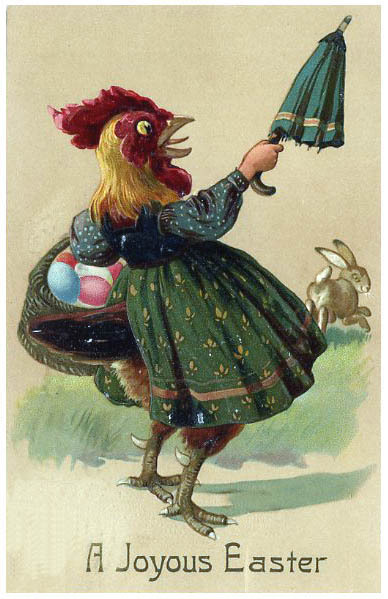 Do trannies often go out in gingham dresses carrying eggs? Or is it just a Gallus gallus thing? Chocolate egg laying bunnies make as much sense as the whole Jesus thing anyway. That picture is really scary. On the other hand, I can't help but think what a good idea: sharp spurs on women's shoes! It would be the fashion hit of the millennium.